Our atlas of faith shows religious diversity around the globe. The largest religious groups are Christianity, Islam, Buddhism, Hinduism. However, they are not uniform, and have hundreds of subgroups. 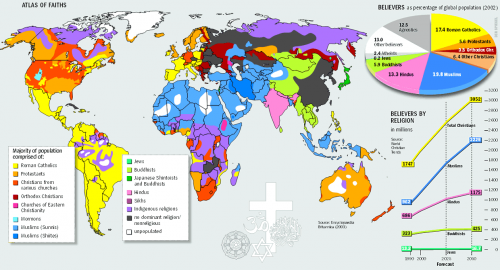 Study the world map of religions showing your students the number of believers of the global population, the number of believers by religion. Have a look at the forecast for how these numbers are expected to change by 2050. Check out the main symbols of major religious groups. Start a project on finding information about the diversity of religious thinking, beliefs, practices, traditions etc.